I want to share a personal story, about when I chose to lead. Startup Weekend is a 3 day event for entrepreneurs to build businesses. I attended in Newcastle in April 2012, purely to learn more about business and meet other entrepreneurs. You can either pitch a business idea and recruit people to join your team, or you can offer your skills to help someone else’s idea. I arrived early, a little unsure of what to expect. I had a a business idea in the back of my mind but I wasn’t confident enough with what I’d need to do. One of the other attendees asked me if I was going to pitch… I said I wasn’t sure. I expected myself to say no, but part of me wanted to. We had a clear choice to pitch and recruit people, or wait and join a team. The time was going to pass either way. As we chatted, two thoughts came to mind. I was asked again – Are you going to pitch? I shared my two thoughts and we both ended up pitching! By arriving early and giving confidence a chance to build, we did it. We both made the choice to lead. And through doing so we learnt way more than we would have done otherwise! And to top it all off, both of our teams ended up winning the opportunity to pitch for investment. 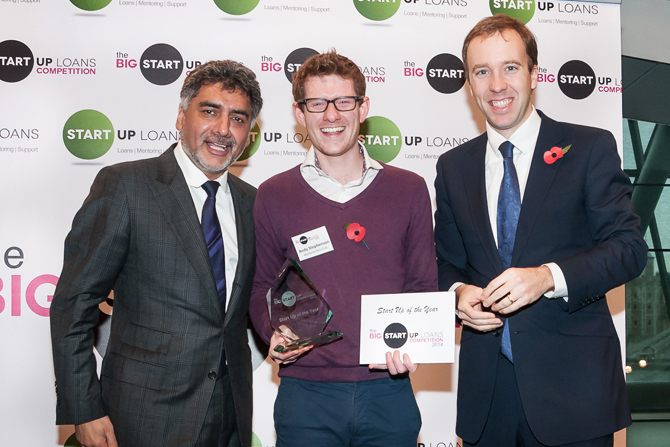 This is my good friend and founder of Weekend Box, Andy Stephenson receiving a Startup Loan award. He’s on a mission to bring family fun through the letter box. (We met at Startup Weekend in Newcastle). Are you going to lead and build your dream? Or follow and build someone else’s?